Sameer and Ahmed stood mesmerized at the glass recycling units in Prem Nagar, their brains working faster than their fingers. Lenses pointed in various directions, multiple shots were taken and the trigger-happy boys, born and raised in Dharavi, wondered why they hadn’t been to these parts of town before. 18-year-old Ahmed came across like an experienced photographer and his shots were better than what you'd expect from a beginner. 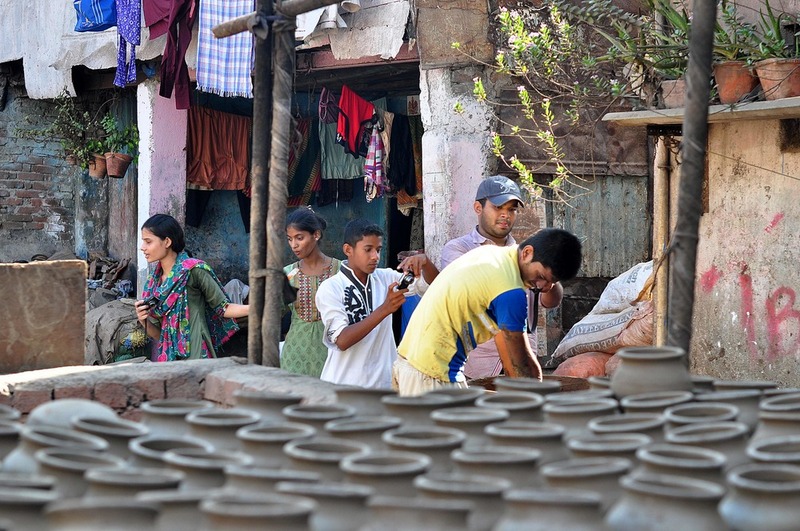 Sameer, 16, was glad to take photos on something other than his mobile phone. The boys were members of a group investigating occupational hazards in the numerous businesses in Dharavi. From the smoke-ridden environments of the potters to the chemical cocktails in the plastic recycling units, the photos captured by these teenagers are a window into the conditions in which people work, live and breathe. Occupational hazards are seen as inevitable in some of the local industries, but documenting them with cameras makes us pause and think about working conditions. The photographs are the building blocks for a yet-to-be-revealed site-specific installation that summarizes the two sides to occupations in Dharavi: hope and hazard. They are digitally manipulated and re-pixellated to form 3-D blocks that are pieced together to form a massive installation. The young photographers experimented with a trial version of the process. With great determination, they made almost 200 paper blocks for a medium sized frame and were surprised by the outcome. Standing close to the piece, it looked like a dizzying assortment of pixels. At a distance the whole picture appeared. Though depicting occupational hazards, the photos collectively show the diversity of people, colours and things that make up Dharavi. According to one participant, the exercise showed that there was a lot of garbage, but a lot of value in it.